I am a menshevik. Steph Gray is a bolshevik. It may not end well. Steph wants a revolution, and he wants it by next summer. He does not believe in the false consciousness of the bourgeois revolution and is wary of alliances with objective supporters of the current regime. Despite the immaturity of the proletariat, they and only they can be the vanguard of the revolution. 1917 was a good year for the bolsheviks, of course. Little was heard of the mensheviks after that, though little groups survived in exile for a surprisingly long time. But while the bolsheviks successfully introduced the language and the superficial structures of communism,1 they made rather less progress on changing the substance. When the façade cracked, what lay behind seemed remarkably unchanged. This is not 1917. Steph is not Felix Dzerzhinsky and shows no signs of wishing to lead the Cheka. But in calling for revolution rather than evolution, Steph is asking us to make a similar choice. The question he raises is a good one. GDS has made very visible strides on the delivery of online information, in part through ruthless intolerance of counter-revolutionary saboteurs. But that has not been matched in the embedding of digital engagement and open policy making across government more widely, where the white armies still control much of the hinterland and where there is still too much tokenistic playing with technology, and not enough real change. He calls for an end to ‘pat on the head’ digital engagement – and that in itself has recruited Stephen Hale to join him on the barricades. As the use of social media becomes more entrenched then I would speculate that this will become increasingly a question of organisational leadership rather than any specific practitioner groups and that it will be important to start discussing where that leadership should come from. By coincidence I was at the Institute for Government on Friday, where Marco Steinberg was talking about the work of the Finnish Innovation Fund and the Helsinki Design Lab. One of his strong messages was the need to identify and address the architecture of problems: it is easy to see particular aspects of an issue, particularly since organisational structures and job roles tend to reinforce a narrow view; it is harder – but essential if we want to achieve innovation – to understand how the pieces fit together and to design solutions in the context of that understanding. Policy makers need strategic designers to rethink systems fundamentally. Open policy making and engagement are central to doing that effectively – though I suspect Steinberg would be sceptical about defining the problem in terms of digital engagement, rather than engagement more generally. There is a a social dimension to engagement which online approaches can complement, but cannot be a substitute for. In the discussion which followed, Matthew Mezey mentioned Jake Chapman’s Demos pamphlet System Failure and made the point that though it was greeted with huge acclaim when it was published ten years ago, it has had almost no long term impact. Lots of people were inspired by the approach; few if any found it possible to make the changes necessary for it to work. That resonated with me because I was one of them: I read System Failure when it first came out in 2002 and saw Chapman talk about his work – but until prompted today, I had almost completely forgotten. As ever, the real question is not about the methodology or the technology, but the organisational culture which inhibits innovation. From that perspective, concentrating on the need to get policy teams blogging, rather than on understanding why digitally enabled policy making is still the exception itself risks being a form of head patting. This concern that civil servants are not using enough knowledge, or the right kinds of knowledge, when making policy is as old as the civil service itself. While the terminology may have changed, laments about the gap between models of evidence-informed policy-making and policy-making in practice, date back to the Haldane report of 1918 and beyond. The fact that this a problem with a history does not, of course, make it any less of a problem. It is depressingly easy to imagine similar lectures being given today and Whitehall is still not famous for openness and transparency. And I also agree with Steph and others that digital engagement tools create possibilities which were scarcely imaginable twenty years ago and that there is real value in their wider adoption. But before jumping to prescriptions, it’s worth understanding the problem a bit better to see what might help and how. Politics is making choices about things people disagree about. If there disagreement without a choice, it’s just an argument. If there is choice without a disagreement, you are talking about – or better still doing – implementation. Policy making as a bureaucratic process (the thing which – some – civil servants do) is a way in to making political choices, but it isn’t the only way in and certainly doesn’t solely determine the choices made. And herein lies one of the biggest problems in politics. Because choosing between political parties should be a straightforward matter of selecting the policy platform that most closely aligns with your own. But it isn’t; it’s about group identity. And to a certain extent it has to be; because this is a representative democracy not a direct democracy, and we are picking people we trust to make decisions down the line. So the first temptation for rationalist bureaucrats to put aside is the belief that there is some right policy waiting to be found, and that policy making is about gathering and sifting the sands of data and opinion until the nugget of truth is found. There are areas where something like that happens, but crudely speaking, the more the issue is politically salient to begin with, the less policy making will look like the rational ideal.3 So the first question is whether we are dealing with a political issue or what, for want of a better word, I will call a technical issue. There is also a critical question about what aspects of policy making we are talking about in the first place. There can be discussions about the process (in a broad sense), identifying data, gathering opinions and perhaps identifying options. There can also be discussions about the substance of the policy in question, not just identifying options, but evaluating them and arguing for a preferred outcome. Civil servants do the first of those, and could undoubtedly do it better. But they don’t do the second in public, and the question of whether they should gets tangled up very quickly with some meaty constitutional issues. So the second question is whether the intention is to be open about the process of a particular piece of policy making or about its substance. All that suggests that there are two important variables here, which together produce that dreaded, but occasionally useful, thing, a two by two matrix. In the sense I am using here, a lot of policy isn’t particularly political. To take one prominent example, the rightly applauded openness of the Government Digital Service is firmly concentrated below the line. That gives them a lot of latitude because politically there is almost no controversy (there aren’t many areas of government activity where milestones are retweeted by leading opposition politicians). Where are the blogs of the policy makers, the operational managers, the chief executives, the tax inspectors, the social researchers, the whole army of people who make up public services? One obvious reason why there aren’t very many bloggers is that there aren’t very many blog readers. The blogosphere is so very large that it’s easy to overlook how very small it is. I don’t think most of the people I work with read blogs, so it’s not surprising that they don’t write them. That’s partly because I inhabit a working environment which is about as inconducive as it could be to a modern online existence but it’s partly because people have other ways of spending their lives, odd though that might seem to the people likely to be reading this. All of which means that, while I would love to be wrong, I am pretty sure that an exhortation for all policy teams to blog, and for all ghost writing to be banned is not going to have quite the immediate transformational impact Steph (and I) would like. The absence of a multitude of blogs is not the problem, it is a symptom of much deeper organisational and cultural characteristics. But all that still leaves the question of the top right quadrant. Of course we shouldn’t assume that the roles of civil servants are locked into the structures of past ages and are beyond improvement. It would take somebody considerably braver than I to argue that were true. But as I find myself saying a lot at the moment – and echoing Marco Steinberg – if you want to change the system, you have to change the system – you can’t just take one small part of it and assume that you can change it while everything in the wider system is unaffected. An independent commission to rewrite the Civil Service Code, to rethink the roles of Ministers, senior officials, and more junior officials in terms of engaging in policy discussion and taking responsibility for decisions. Alongside it, a frank Parliamentary discussion about the responsibilities of backbenchers and Opposition in holding government to account without stifling open policymaking. I tend to be sceptical about ideas which depend on taking politics out of politics (not least because I tend to the slightly unfashionable view that politics is a good thing, not a bad thing).5 The idea that any opposition would – or should – avoid challenging and discussing ideas put forward from within government is not just unrealistic but wrong.6 There is in any case no prospect of such a commission, and even if there were, answers would be a long way off, so this won’t help meet Steph’s challenge to make a radical difference by summer 2014. Even if we were to take away the question of political alignment there is still a much more universal question of organisational alignment. Organisations which allow and encourage their employees to think aloud about their employer’s business and its strategic direction are rare oases of self-confidence. Other than a few licensed mavericks (who tend to be smart enough not to bite the hand which is feeding them), that is just not how organisations work. Ending the political neutrality of civil servants wouldn’t stop the secretary of state being the boss. So my pragmatic view is that starting towards the bottom and the left of the matrix makes good sense. Let’s encourage people to build up confidence, experience and good practice there, moving up and to the right over time. For the reasons I have outlined, the top right corner is much more difficult territory. But if we stop to solve those problems now, we risk getting completely bogged down. Let’s also stop framing the question as being about the use of digital tools. It is an encouraging sign of maturity when we can stop qualifying things with ‘electronic’ or ‘digital’. Digital engagement is not a digital problem, it is an engagement problem. More digital activity will be a symptom of better engagement. Better engagement won’t, on the whole, be a symptom of more digital. The mensheviks need to be more radical about the actions they are willing to take and not just rest on theory and ideology. But the bolsheviks need to read System Failure and decide what revolution they really want to bring about. i am often puzzled that web-ist commentators/splitters forget the whole system is about politics. and the notion that there is a rational first-best answer to most policy problem just belies a lack of experience. i notice though that you focus only on the bit players in the revolutionary tumolt of the early C20th. It was Lenin and Stalin that really changed things and whilst one can’t condone their methods of course, there don’t seem to be figures of that stature in this space. Attempting to purge the theorists would be a high risk approach for me to take, since I don’t fancy my life expectancy in the camps. I am less troubled about there being no Lenins or Stalins in this story, and more concerned that we don’t fall under the influence of some Lysenko. and therein lies the problem – the weak, diffuse leadership of how civil servants do their job in Whitehall prevents system change. Stefan, as you say – ‘the real question is not about the methodology or the technology, but the organisational culture which inhibits innovation’ so, let’s start with that. What would help an organisational culture to change? I have worked with the thornier issues surrounding organisational change and collective identity all my life, and it amazes me how much skirting there is around that, and without addressing the motivational root of an established culture, getting under the skin of it and offering a better alternative, this goes nowhere. Yes, there tends to be an inherent ‘foggy bottom’ to political systems and as Will has said the weak, diffuse nature of political cultures is an inherent challenge, but it is not an insurmountable one. It exists because there is little offered in the way of a better alternative and digital transparency and the rebalancing of corporate and individual reputation is changing that. The truism is that systemically and individually things don’t move away from stasis, they move towards opportunity. My hunch and my experience is that systems are capable of change, but they are contingent on a palatable reframing and an elegant means of transition being offered to them. Enjoyable and interesting post, Stefan, but I am afraid I am even more pessimistic than you are :-( The problem is exactly as you suggest that policy is about making choices where people disagree. I think that in terms of your two by two matrix an awful lot of stuff falls into the political box. To exaggerate slightly, if one defines “political” as something the Daily Mail could potentially make mischief with, then virtually everything is political. Similarly, it is not to hard to see why lots of public servants with interesting jobs may not feel inclined to blog – the problem for the PM’s Principal Private Secretary is not just that he has no time (which is no doubt more than true) but that even if he did have time to write a blog, he would probably only be able to tell us what he had for breakfast. After all, you yourself write a blog that draws on your work experience but carefully (and understandably) avoids giving any too concrete indications on what you are doing or the specific difficulties you encounter. I don’t think you are more pessimistic than I am – I suspect our pessimism may be quite highly correlated on this. But you are right: the relative size of the top right box does really matter. If it’s more or less everything, then our options and opportunities are very different from those we have if it’s a smaller proportion of the whole. We are not going to see live blogging from No10, but I am not sure that that’s the right question (or at least the right first question). 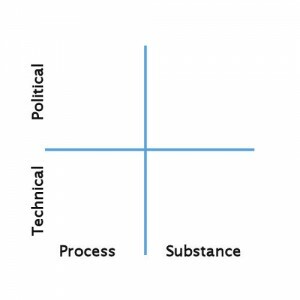 I think it’s at worth exploring whether there is a difference between process and substance at the political level of my matrix. Nobody in No10 or anywhere else is likely to be blogging their thoughts on which options to put to ministers, still less what recommendation to make. But in a lot of policy areas – including those squarely hit by your Daily Mail test – the process of understanding the landscape and creating a conversation with those with interests or an interest in it creates opportunities which are nowhere near being explored to their limit. Good points and a good post that requires more space to respond. A couple of quick points to consider are the following. How policy is made reflects the culture of an organisation. The culture as it relfects the politics of the organisation and the culture in that how work is done. The latter more likely dominates the former and is overlooked. 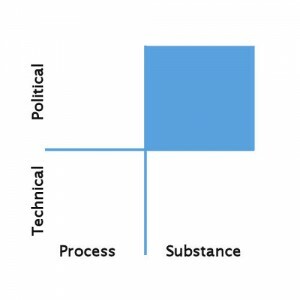 The politics are clear it is the process that becomes muddle in some ways on purpose as the organisation, the infrastructure, does what its culture requires. Political decisions get watered down to the point they become what was done previously but with a different name. “The absence of a multitude of blogs is not the problem, it is a symptom of much deeper organisational and cultural characteristics. Yet, it is the that culture which has kept the revolution from happening because the culture is not designed to be innovative. yes, innovation happens, but it is not designed to reward it for any number of valid reasons. There are valid reasons why it is Google rather than the governemnt that has mapped all of our roads and photographs all of our homes. Second, I would, and will, continue to differentiate digital from physical engagement. I will do this because I see an important distinction between the two types of engagement because electronic, if it becomes *the* method, discriminates against the non-digital. To put it crudely and directly, are you less human, less able to be fully human, less able to participate in the public affairs of the state, if you are not online? I find that to be a rather disturbing potential future that is implicit in the approach to digital. In particular, because we do not own our digital content or our personal data that is trafficked, managed, and modelled online. We may acccess it, but we do not own it, which suggests that our digital rights are less than our human rights, or at least not reflectign them. I can insist on physical privacy but I cannot insist on digital privacy. Third, I like having represenatives who make policy and law so I do not have to. I do not want to grow my own vegetables, raise my own chicken, make my own pasta. I do not want to make my own laws or become a policy maker by default. What i do want, and what i demand as a democratic right, is the ability to hold those decision makers, no matter how bureaucratic and hiddent from the demoncratic mandate, to account. In that regard, we need a transparency that open, linked data, offers so taht we can monitor and manage the policies that are made abotu us and for us. A great post that requires more thought and time than I have at present. Thanks for the stimulating discussion.